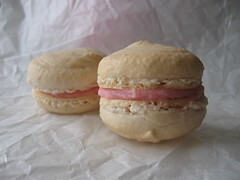 Strawberry and Rose Macarons - Do You Know The Muffin Man? Recipes from Food Beam and A La Cuisine! Notes: These didn't turn out the way I wanted. I added a few drops of strawberry essence that I bought from Cuoca in Tokyo and a few drops of red food colouring. Neither contributed very much to the macaron batter. I let them sit for an hour but they didn't flatten out: I should try mixing the batter longer. The baking time is only ten minutes, but the macarons still took on a bit of colour and were still thicker than I wanted. One thing I want to try is making strawberry dust and flavouring the batter with that. My plan was to make a rose-flavoured filling, but infusing the whipping cream with dried rosebuds didn't work. White chocolate made the ganache a yucky beige colour so more food colouring nudged it towards pink. I found some Greek rose petal preserves at the supermarket so I added a tiny bit to the centre of each cookie. Getting an intense flavour into macarons seems to be quite a challenge.